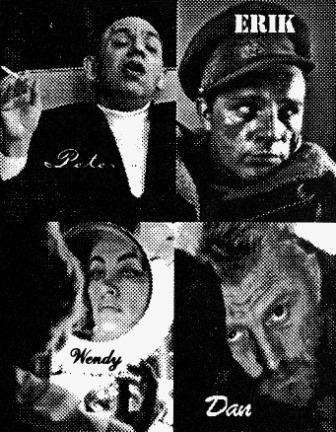 Quo Modo, or QM, was a Philadelphia-based journal that I worked on with a slew of other people in late 1992 and early 1993. 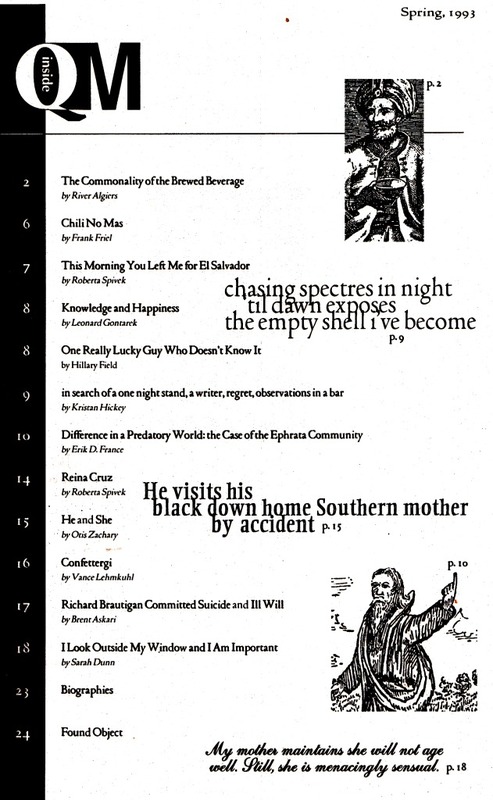 Dan Kay was in charge of layout: he came up with the above imagery, and the table of contents page visible below. For the Spring 1993 edition, the primary staff consisted of Peter Wilson, Erik D. France, Wendy Rosenfeld and Dan Kay. Others that helped out in various ways: Shara Gordon, Taso Mouhteros, John Martin, Brian Campbell, Nga Mai, Steven Ducownay, Janet Hoefling, Rich Wiener, Jonathan Apothaker, Dirk Peterson and Margaret Cooper. Some of the showcased writers: River Algiers, Hillary Esta Field, Robert Spivek, Leonard Gontarek, Sarah Dunn, Otis Zachary, Brent Askari, Kristan Hickey and Vance Lemkuhl. This was produced in the last days before the internet truly took hold. For those who remember, the words "1200 baud" must still register somewhere in your conciousness. Not to put too fine a point on it, but communications were slower then.